Unlike our Rear Suspension testing, where we tested on a shock dyno in a lab, And on the street, with the Front Suspension testing, we tested on the street...that is where it really matters. We used 2 Sportsters, 2 Dynas, a Heritage Softail, a Street Glide, an Electra-Glide, and a Tri-Glide. We have two “courses” that we ran through, slowly, cruising speed, and fast. Riding two circuits, with straights, curves smooth & bumpy surfaces. We rode over the same bumps & dips under acceleration, cruising and braking conditions. Safety & Tire Wear Compliance Test: With the front brakes applied and the throttle applied, we hit a sharp edged bump, as well as 2 rounded bumps to see if the tire stayed in contact with the road the entire time. Taking corners for stability and road “feel” under acceleration and braking (not recommended). Riding solo, 2-up & loaded. Pulling wheelies (not on the Softail) and seeing what it felt like coming down. We have made the decision to not list the products we tested that produced less than favorable results, nor have we listed the products that were very expensive and produced results no better than significantly less expensive options. In all our testing, the stock suspension was consistently the least favourable, and the AK-20 Cartridge was the most favourable. For grading we used the stock as a reference # of 0, and the AK-20 as a reference # of 100. Everything else was awarded points between 0-100, based on how much better they are than stock, and how close they are to the AK-20 Cartridge Kit. 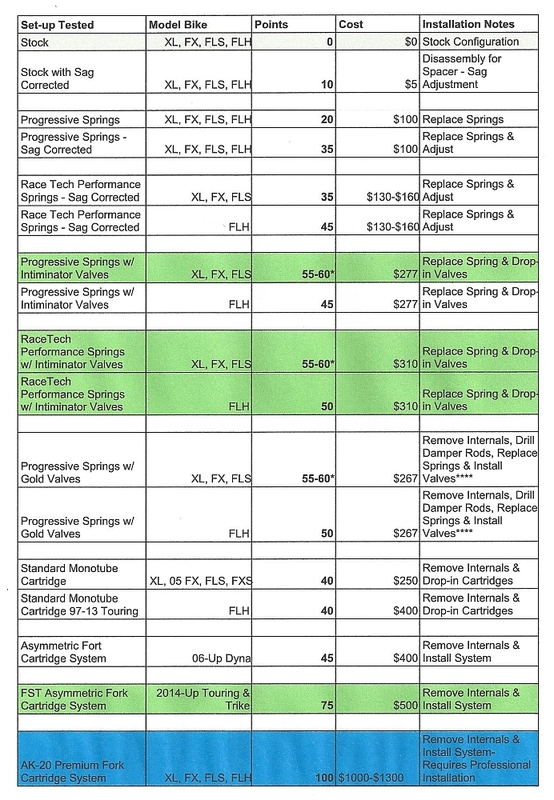 * The RaceTech High Performance Springs & Progressive Springs with Intiminator were given a 55-60 because while the Race Tech were a little stiffer, which was preferred for road feel with aggressive riding, the Progressive were a bit plusher ride for cruising, but not quite as good of a feel for aggressive riding. ****With the Gold Valve Emulators that are quite a few extra steps in the installation process, including complete disassembly of the forks, drilling holes in the Damper Rods, and reassembly. Because the Intiminators produce just as good a result, and are much easier to install, we prefer them. Perhaps the biggest surprise was the Frequency Sensing Technology Progressive Fork Cartridge System for the later year Baggers and Trikes. For less than 50% of the cost they were 75% as good as the AK-20's!